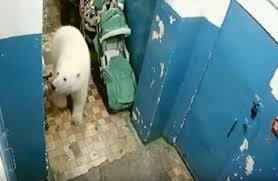 Lord, today we pray for the northeastern Russian community of Novaya Zemlya, which is being invaded by polar bears. This small town of about 2500 people having up to 10 polar bears within its territory at a time has changed people’s routines and brought a great deal of fear. Please be with this community as the people try to discern solutions. Calm their fears. Protect them from dangerous encounters. Help them learn new safety habits to adapt to this situation. We are thankful for the deterrence tools that are being set up and for the World Wildlife Fund’s efforts to help communities like this. Again, we pray for safety, particularly for children on their way to and from school. In Jesus’ name we pray, amen.